School bus drivers say drivers have been ignoring their stop signals when unloading students and blowing by them. Hamtramck drivers, well some of you at least, go back to driving school. 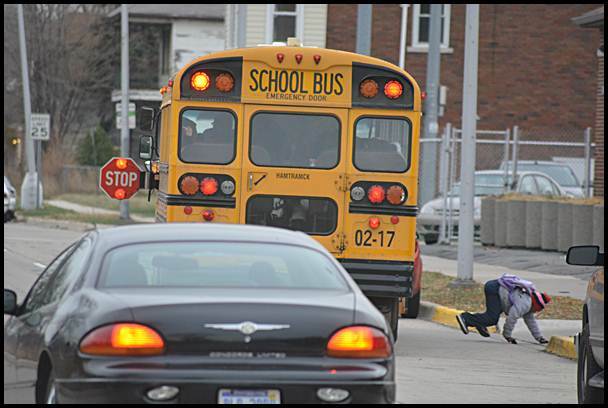 “It seems like an epidemic,” said an exasperated Wayne Satterfield, the Director of Transportation for the Hamtramck Public School District. He’s talking about the increasing — and ongoing — problem of drivers not paying attention to when school buses stop in the street to unload students. Despite having a “stop” sign displayed and flashing lights, drivers are passing the buses — a huge no-no when it comes to disobeying traffic laws. “It’s constant, daily,” said Satterfield. But bus drivers can fight back. By law, if the drivers can get a plate number and description of the driver, the police department will mail a ticket to the offender. What’s waiting for them is a hefty fine and four points added to their driving record. Police Chief Max Garbarino said that when officers have spare time they follow school buses to catch offenders. “It’s always been an issue with us,” Garbarino said. So far, there have been no injuries or even close calls to students, but Satterfield fears it’s just a matter of time. In the meantime, he said his bus drivers are “keeping a watchful eye” on their passengers when they step off the bus.